I would also like to go on record to dispute his world record claim as my Aunt Bessie, who weighs in at a hefty 300 pounds (136 Kg), has ‘bingo wings’ that measure 32 inches. But you don’t hear her going on about it, do you? 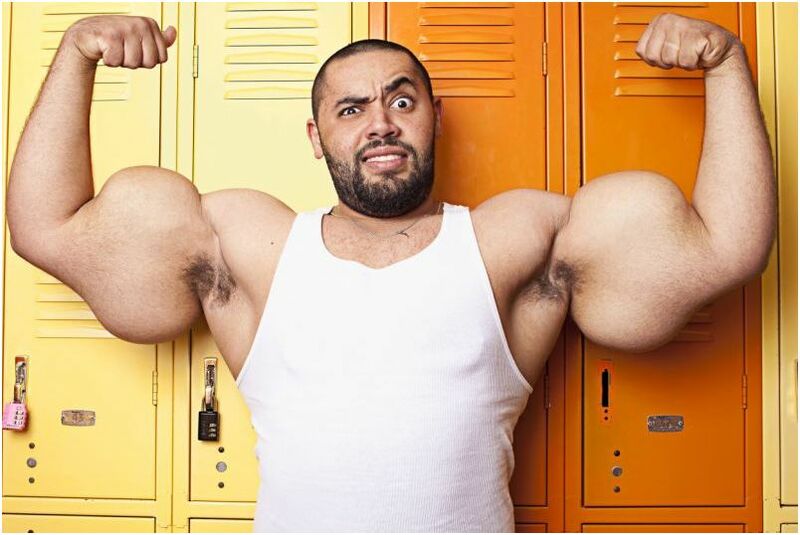 Speaking of Mrs Ismail, I wonder why she hasn’t had a word with him about his obsessive body-building. Impressive ‘guns’ are understandably much sought-after, but when your arms start to resemble anti-tank mines then it’s nature’s way of telling you that you’ve gone too far. So how can Ismail possibly think he looks good? To me this looks like a classic case of body dismorphic disorder which, amongst other symptoms, is characterised by a preoccupation with a particular part of the body and obsessive exercising to achieve the desired look, with the sufferer inevitably never quite reaching that ‘goal’. It’s just as well that he doesn’t spend as much time working out on other parts of his body, otherwise he’d look like the Michelin Man with problem flatulence. Maybe Ismail also has just a smidgen of the less medically diagnosed, but commonly observed in traditional folklore condition known as small man syndrome. He mistakenly believes that growing his size widthways will earn him respect. Yet, not knowing where to draw the line is one way to ensure ridicule. Those stares from strangers are not admiration, they are looks of astonishment. But at least he’s got the record, eh? Congrats. Yes, I guess it could be worse!